With a wallet case, you can cut down on your daily carry by keeping your most important cards and cash all with your Galaxy Note 8. Coupled with Samsung or Android Pay, it's really all you'd need anyways to pay for most things in your day-to-day life. So ditch your old wallet and get a wallet case for your phone! The only thing better than a brand new leather case is an aged leather case. Nomad's offering is made of genuine brown leather that only gets better over time. This case screams high class with a microfiber lining that looks great and protects the display, along with card slots for up to six cards and folded cash. So maybe you like the added functionality of a wallet case, but hate how most options completely cover up the phone's design. It's a valid concern, and one that Griffin Technology has addressed with its Survivor Clear Wallet. On the back is a rugged TPU clear case that will keep your phone secure while the front cover, made of polycarbonate, features three card slots on the inside. If you're looking for a hand-crafted wallet case made of genuine leather (and you've got money to burn), you need to check out Story Leather's collection of high-quality leather cases for smartphones, they're really something special. You get to chose between 50 different leather colors and textures as you create a case that's unique to you and your phone. There's a ton of different styles to choose from, but because you're here for a wallet case, we've linked to the book-style case here. The ProCase wallet case includes three card slots, but based on reviews, the slots can easily handle more than one card — and you might find your cards slip out too easily otherwise. But your phone will never slip out, thanks to the form-fitting inner shell, which should offer great protection from shocks and drops on the corners and edges. 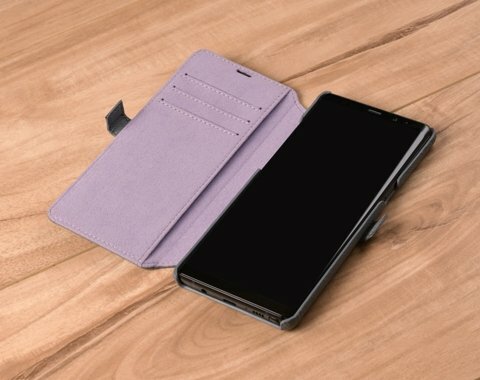 Spigen also has a more traditional folio-style wallet case for the Note 8 and it's a really solid option. Made with synthetic leather that feels pretty genuine, this case has all the features you'd want including three card slots and a sturdy polycarbonate shell that keeps your phone secure. The front flap is kept closed with a magnetic strap, and can also fold over to become a kickstand for hands-free media viewing. If you want the functionality of a wallet case that doesn't look like a wallet case at all, you need to check out the Spigen Slim Armor CS. From the front, it looks like a standard phone case, but on the back, you'll find a hidden compartment where you can store two cards — say a credit card and your photo ID — or a reserve of cash. 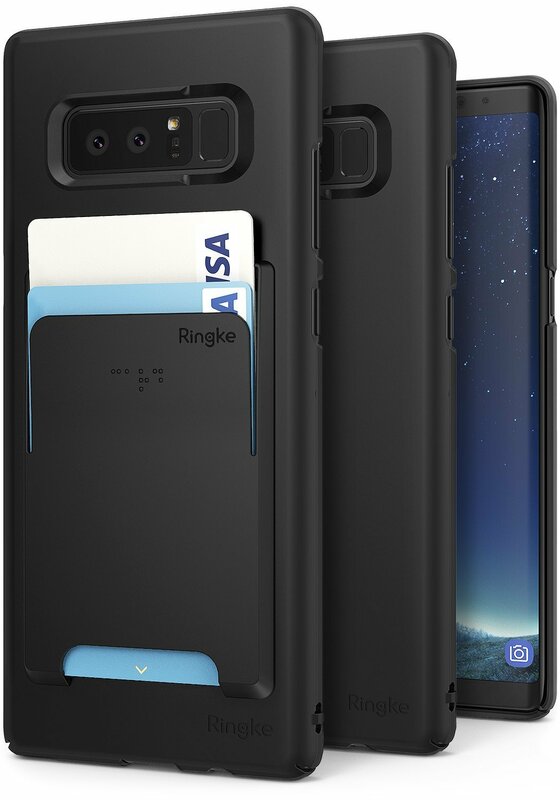 Ringke's slim case for the Note 8 is pretty basic as you'd expect, but it has included a pretty nice accessory for cutting down your daily carry. 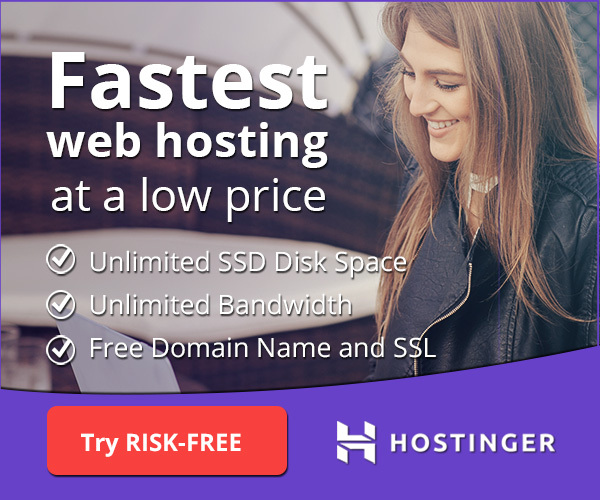 Along with this ultra thin case that only adds about 2mm of bulk to your phone, Ringke includes an adhesive card slot holder that's capable of holding two cards — say your photo ID and a credit card. It's the perfect accessory for traveling or going out to the bar if you want to keep your carry light. 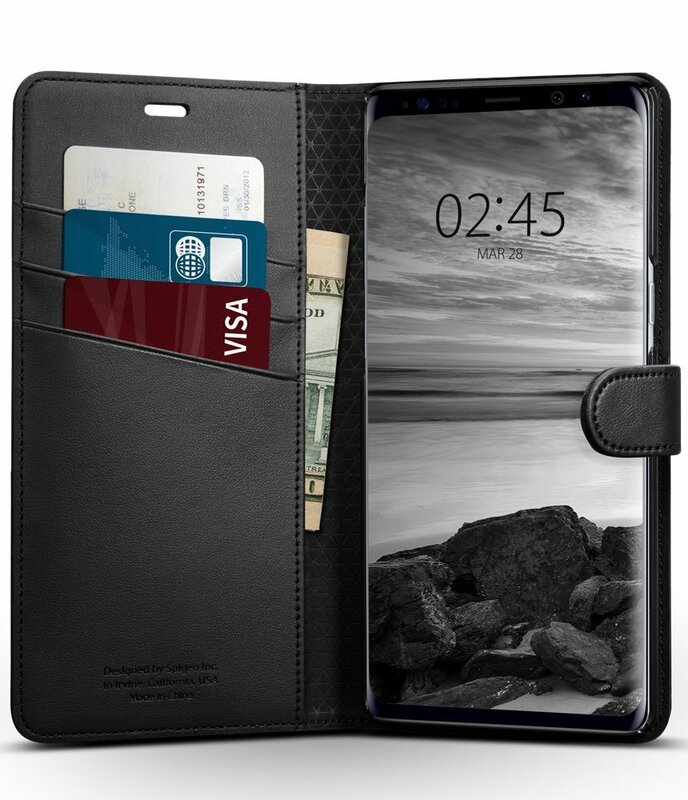 I'm always of the opinion if you're going to buy an expensive and large phone such as the Note 8, you might as well go with a wallet case, too. Big phones take up a lot of space in your pocket or bag, so why not keep it well protected while also adding some extra functionality as well? For the Galaxy Note 8, I'll recommend the Nomad Folio Wallet Case which is also available on clearance at Best Buy. 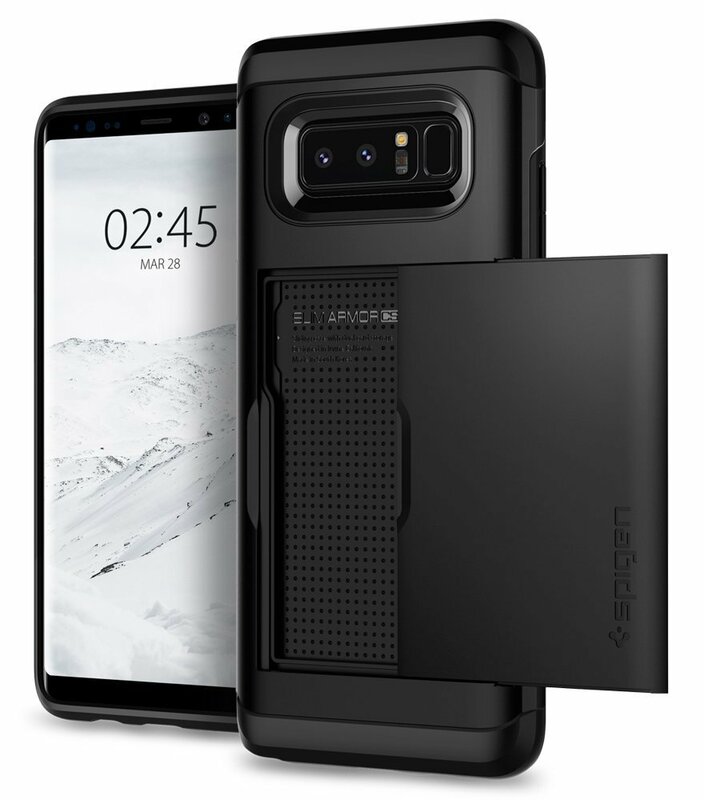 The Spigen Wallet S offers the best value for a folio style case, but if you're looking for a non-tradition case I'd recommend the Spigen Slim Armor CS over the Ringke Slim Case because I prefer the built-in design.